« *** WINNERS *** Gina, Suzanne, Anne-Marie and Sunshyn are Living the Life of Riley! CONGRATS! It's time to pull back the spending reigns and prepare for holiday gift expenses. During a time when most shoppers are reducing their spending altogether, it's especially important to make a realistic budget for your gift list. While the following tips are intended to help you manage holiday spending, many are applicable to saving money all year 'round. The National Retail Federation's (NRF) 2011 Holiday Consumer Intentions and Actions Survey reported that holiday shoppers plan to spend an average of $704.18 on gifts this season, representing a slight decrease over last year. Making a budget is a no-brainer, but challenge yourself to go under budget this year. Track your spending using the Toshl app to keep tabs on what you're shelling out and how much you have left. 2. Cut down on dining expenses. 'Tis the season for holiday dinners at expensive restaurants, but this expenditure is the last thing your budget needs. Replace the annual white-tablecloth celebration with an intimate gathering at home. Guests can bring a dish to share and everyone can comfortably converse without interruption from servers or obnoxious patrons. 3. Refrain from personal purchases. This one is tough during a time when bargains abound, but it's especially important to avoid making purchases for yourself when you still have people on your gift list. That same NRF study reported the average consumer will spend approximately $130 on gifts for themselves. Imagine the dent you could make in your recipient list using that cash. 4. Reduce everyday costs with resourcefulness. The toughest part of budgeting for holiday gifts is not letting it eat into the money required for everyday items, including food. Consider developing a menu for the week to reduce unnecessary food purchases, and use websites like Gojee.com to develop dishes around what you already have in your pantry. When you do head to the store to stock up on provisions, arm yourself with printable grocery coupons from such sites as Coupon Sherpa. 5. Trim your gift list. The spirit of the season often yields never-ending gift lists, especially when you're surprised by presents from people who didn't make the cut. Trim your gift list to essential recipients and come up with inexpensive tokens for everyone else. Homemade goodies, cards with heartfelt wishes and offers of service (babysitting, for example) are great options for neighbors and coworkers and can be produced last-minute. 6. Research gifts to find best bargain. Santa never misses the mark by making a list and checking it twice, so take a hint from the jolly man in red and do the same. Once you develop a list of essential recipients, bargain shop for gifts before making your final purchase. It's tempting to get all your shopping done over a weekend just to get it out of the way, but doing so means missing out on bargain-rich opportunities. Retailers tighten return policies around the holidays, so be sure you read the fine print before making a purchase. Price matching is all the rage these days, too, so it pays (literally) to know a store's policy on compensating shoppers who find better deals elsewhere. Walmart recently announced it will provide gift cards in the amount of the price difference, and Bed Bath and Beyond will even price match items found on Amazon.com. With all the advice circulating about when to land the best deal, it ultimately pays to shop throughout the holiday season. Make a game plan for Black Friday and Cyber Monday purchases with these do's and dont's, and don't forget about Free Shipping Day for last-minute items. The one-day online event is scheduled for Friday, Dec. 16 and features free shipping offers from over 2,000 merchants with delivery by Christmas Eve. It's not easy sticking to a budget and the holidays make the task even more challenging. Paying for purchases with credit cards is risky since the "I'll pay for it later" mentality breeds over-spending. 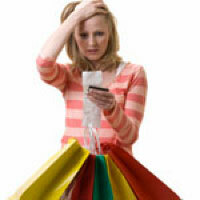 Opt to pay with cash and experience your hard-earned money disappear from your finger tips. This sight alone will make you think twice about unnecessary or overpriced purchases, and help you stick to your budget. 2 Responses to Resist the Urge to Overspend This Holiday Season with These Budget-Friendly Shopping Tips! These are good tips. It’s always hard not going overboard when you’re shopping for others, especially when it’s so tempting to get gifts that wow, but ultimately it’s more important not to compromise ourselves financially. Thanks for your visit at yummy mummy yesterday! I’m a follower here too! Shop Safe This Holiday Season by Following These Toy Safety Guidelines for Age-Appropriate Toys!